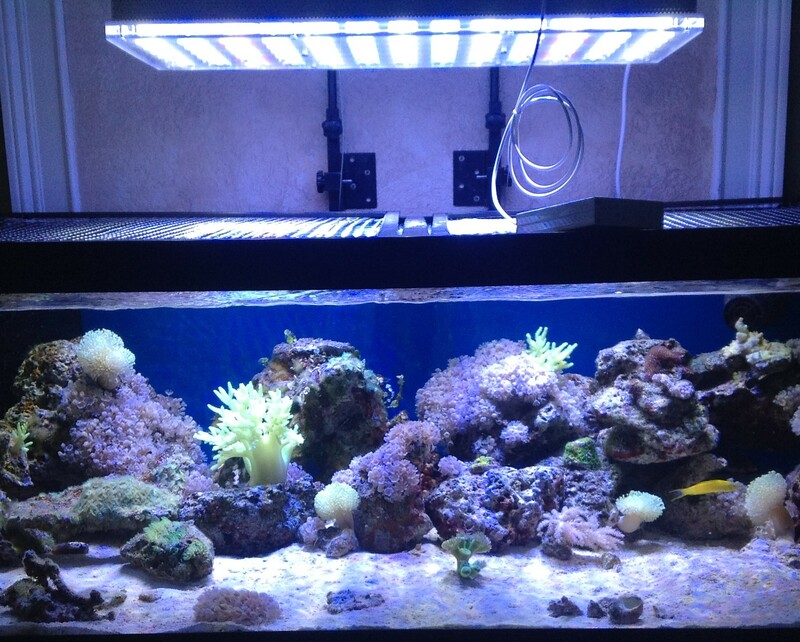 Jennifer, a recent Orphek customer sent us a few pictures of her new Atlantik suspended above her 48” long reef aquarium. Jennifer is very pleased with her purchase and has shared her feelings with us. Jennifer also stated that she is very surprised that all that was required was one Atlantik for this four foot tank. She said she would have required three units of another brand to do the same thing, and at a much higher cost than the Atlantik. 1. What led to your decision to go with LED lighting for this project? I wanted to upgrade my lighting from T5. I also want to improve the color of my corals. 2. Why did you choose Orphek and were their other brands you considered. Because of the salesperson, price and lighting options/programs. 3. Is the lighting controlled with an automatic timer or digital controller? 4. How do you feel about the quality of the Orphek LEDs? The light is solidly made and is high quality. 5. What is your feeling on the intensity of the lighting. I am very impressed with how high this light can go above the sandbed and still be able to grow high light requiring corals. 6. How deep is the aquarium? 7. Would you choose Orphek again for another project? 8. How do you feel about the color spectrum the Orphek LEDs emit? I love the look of my tank. It appears to duplicate lighting on a reef. 9. Did you feel the cost was reasonable for the performance? 10. Would you recommend Orphek to others? Since this article was written, we have received another email from Jennifer which we would like to share with our readers. “James, as you may remember, I was looking to upgrade my lighting because of a SPS I bought last year that had completely lost color. In just the 2 weeks I’ve been running the acclimation program on the Atlantik, I cannot believe how much the color is returning. It’s going to be a while before it gets back to the beautiful green it was but it’s on the way. I do have before and after pics, although the pics don’t really show how green it is. I’m very happy with this light! Thanks again!